THE LATE, great, and sadly missed Robin Williams once observed: “You’re only given a little spark of madness. You mustn’t lose it.” It is a sentiment taken to heart by two of Galway’s finest comedic performers - Aindrias De Staic and Paraic Breathnach. Both Aindrias and Paraic are presenting outstandingly sparky, and ever-so-slightly mad, one-man shows at this year’s Vodafone Comedy Carnival. Aindrias' show, Shtax: Misadventures Of A Latchiko is in The Loft, Seven, Bridge Street, Thursday October 25 at 8pm. 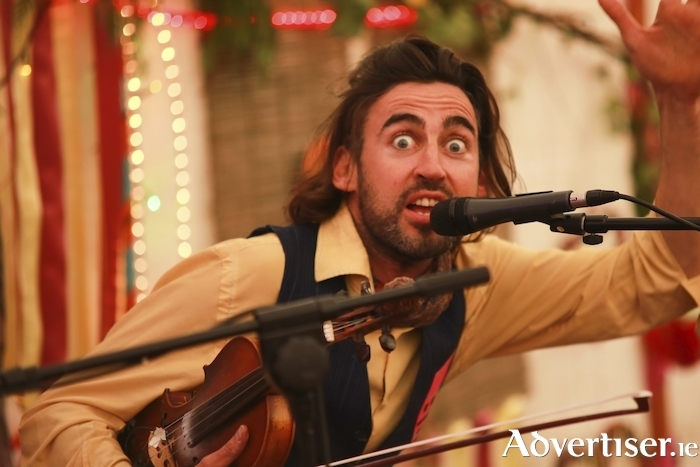 Described by The Scotsman as, "a wild-eyed shock of Celtic unpredictability", the legendary bard and wandering minstrel is coming home with a bucketful of tall tales, short stories, and tasty tunes. Speaking on the subject of madness – or at least the insane early years of Macnas – will be the inimitable Paraic Breathnach [pictured above] in The Macnas Was On Me in The Mick Lally Theatre, Thursday October 25 at 7.45pm. In a seanachie style, Paraic reflects on his personal journey to theatre with an emphasis on the sheer lunacy behind the scenes of great Galway cultural events such as Gulliver on the beach, U2's Zooropa, to Macnas excursions to Bellmullet and Bogota.